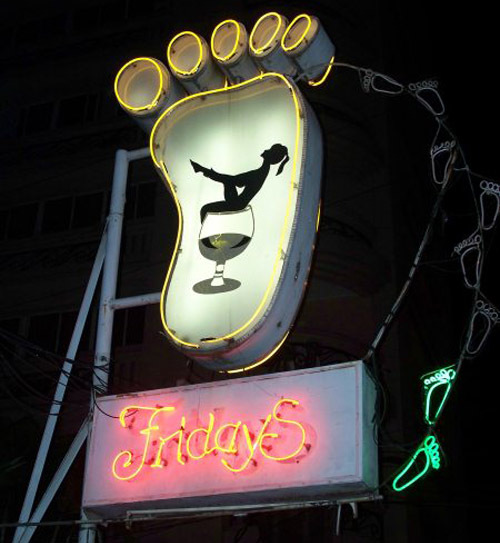 Friday's is a fun mid sized Bikini Bar that sits down at the far end of P. Burgos, right across the street from Jools Nightclub. Friday's is your old style Bikini Bar with a small stage at the back of the bar, and ample seating to view the girls dancing on stage. I've never been disappointed at the talent at Friday's, with gorgeous 18, 19 and 20 year old Filipino beauties gracing the stage. The club is alot of fun, well priced, and full of hot Pinay bar girls waiting for a barfine. The club is great for those wanting a place to have some "Short Time" action, as it has it's own KTV room in the back of the club. The KTV room has a big KTV TV, sound system, and seating where you can do the "dirty deed" with a bargill you bring back to the room. Barfines are 3000p, standard barfine price for Makati. That gives you a girl for the night. Taking a girl to the back room is cheaper, since you'll be forced to buy ladies drinks when she is in the back room with you. All in all, the club is a must visit for at least one beer. There are plenty of cute girls to keep you company throughout the night.